The hotel was clean comfortable and the staff were friendly and helpful. This is a basic hotel which reflects the price. But the bed was comfortable, wifi good, tv new and room very Clean! very good value! Where can I find hotels in Assiniboia that are near tourist attractions? With only 1 quality accommodation option within a 0.1 kilometres (0.06 miles) of central Assiniboia, it's worth securing your room well in advance. There are a handful of accommodation options within easy walking distance from the center of Assiniboia. The Assiniboia Canalta is an ideal choice as it's only 3 kilometres (2 miles) away. From the middle of Assiniboia, it is 0.9 kilometres (0.6 miles) to the Assiniboia Canalta. While you are in Southwestern Saskatchewan you can make a visit to the Western Development Museum and stay the night in Moose Jaw, which is 90 kilometres (57 miles) to the north of central Assiniboia. The Temple Gardens Hotel & Spa and Days Inn Moose Jaw are among the choices. Just because you're far from home, doesn't mean you can't enjoy your obsession for sports. Moose Jaw Civic Centre is situated 90 kilometres (57 miles) to the north of Assiniboia. 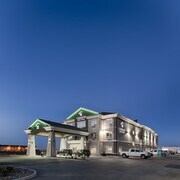 Sleep near the action at the Heritage Inn Hotel & Convention Centre Moose Jaw or the Comfort Inn & Suites. Regina International Airport is a nearby airport for arriving in Assiniboia. It is 130 kilometres (81 miles) away. If you plan to stay nearby, try the The Hotel Saskatchewan, Autograph Collection or Best Western Seven Oaks Inn. Are there hotels in other cities near Assiniboia? 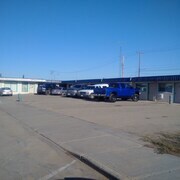 What other types of accommodations are available in Assiniboia? Explore Assiniboia with Expedia.ca’s Travel Guides to find the best flights, cars, holiday packages and more!